Yam was an African kingdom that existed in ancient times. Not much is known about this ancient kingdom, and what little we do know about it comes from a few Egyptian texts belonging to the Old Kingdom period. Based on these texts, we know that the people of Yam had contacts, specifically trade and military, with the ancient Egyptians of the Old Kingdom. Other than that, nothing much can be said with certain about this kingdom. Where Was the Kingdom of Yam? The main mystery about Yam is its exact location. There are some clues in the ancient sources as to where Yam is situated. Nevertheless, these are not clear enough, and modern scholars have disagreed with each other as to how such clues should be understood. The clues for Yam’s whereabouts can be found in a tomb inscription known as the Autobiography of Harkhuf . As the title of this text suggests, this inscription belonged to a man named Harkhuf, a governor of Upper Egypt who lived during the 6th Dynasty (around 2345 BC – 2181 BC), and served under the pharaohs Merenre and Pepi II. In Harkhuf’s account, the governor stated that he had made four expeditions into Nubia during his lifetime. During the first expedition, Harkhuf travelled to the south with his father, the “ritual priest Iry”. The two men were there to “explore a road into this country [i.e. Yam]”, which they managed to do “in only seven months”. At the end of the expedition, “all (kinds of) gifts from it” were brought back to Egypt, for which he was “very greatly praised”. For one reason or another, Harkhuf decided that the action of the “chief of Yam” was not suitable, and decided to interfere in the affairs of Yam. 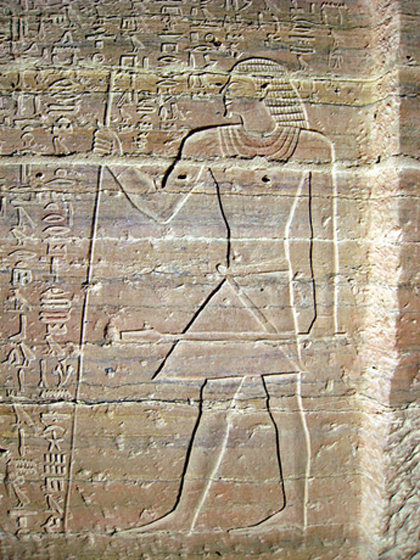 Perhaps he was aware that Yam would be no match for Temeh, or that a stronger Yam would be a threat to Egypt, or Temeh was one of Egypt’s trade partners as well. Whatever the reason(s), Harkhuf “went forth after him to the land of Temeh and I pacified him, until he praised all the gods for the king's sake.” Harkhuf used diplomacy, rather than military might to pacify the chief of Yam. Whilst Harkhuf’s account provides a considerable amount of information about Yam, it has been pointed out that there are two questions which have divided scholars as to the location of Yam. The first is about the total distance covered by the round trip between Egypt and Yam (Harkhuf only provides the number of months required for his journey), and the routes followed by Harkhuf to Yam and back to Egypt (what exactly were the Elephantine and Uhet roads?). 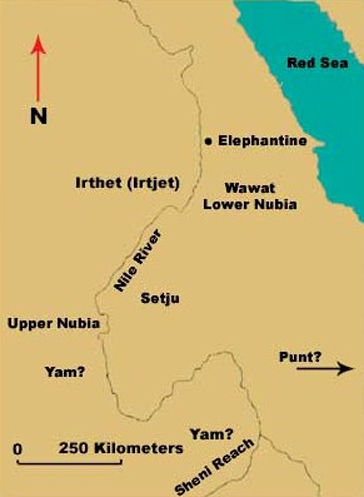 As a result of differences in opinion, the area occupied by Yam has been placed in several different places, including “the desert west of Upper Nubia”, in Lower Nubia, further south below the six cataracts of the Nile, and even further west in Chad. Lobban Jr., R. A., 2004. Historical Dictionary of Ancient and Medieval Nubia. Lanham, Md. : The Scarecrow Press, Inc..
O'Connor, D., 1986. The Locations of Yam and Kush and Their Historical Implications. Journal of the American Research Center in Egypt, Volume 23, pp. 27-50.